Reiki II is the second step in Reiki Healing Mastery. The prerequisite for this class is the successful completion of Reiki I. Reiki II is presented as a combination of lecture, discussion, meditation, and demonstration and practice of treatment of others; distance healing is also practiced. You will learn the three Second Degree Reiki Symbols, their meaning and use, and you will receive guidance in establishing a professional Reiki practice. Upon successful completion, you will be recognized as a Reiki II Practitioner. 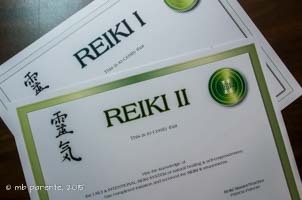 Prerequisite: Successful completion of Reiki I. If not a student of Patricia Parente Reiki for Reiki I, a copy of your certificate must be provided and your attunement received in person. Class Length: Approximately 12-14 hours of class time; typically conducted over two days (not consecutive days unless requested) , plus independent study before Days 1 and 2. Materials: Use your manual from Reiki I, Reiki: The Healing Touch, First and Second Degree Manual; receive supplemental charts and materials from Patricia Parente Reiki.